I asked students to write the syllabus. You won’t believe what happened next. Yesterday was the first day of the new semester, and the first day of “Introduction to Public Humanities.” I’ve taught this course most years since I established the public humanities program twelve years ago. It’s the theory half of the introductory courses, paired with “Methods in Public Humanities.” It’s usually taught in the fall. But I was on leave, and so this year the public humanities students got methods first, and then theory. It’s an interesting philosophical question: which comes first, the method or the theory? It’s tied to the peculiar place of theory in public humanities. It can be useful: it lets us step back from the moment, from the details of a case study. But it can also be used to obfuscate, to make things harder than they need to be, to make them less public. You can hide behind theory. My general take: In public work, theory should serve as a foundation. It underpins, but it’s invisible in the final product. You work things through using the theory that’s useful to you, and then explain it in simple terms. Theory should outlast outlast the details of current practice. In designing the course, I like to imagine students twenty years from now, when they’re running a museum or community organization, and trying to rethink things from scratch, trying to reinvent an organization for changing times. What are the basics that they’lll build upon? That’s what I’d like this course to offer. Usually, the first week of Introduction offers an “introduction” to the idea of public humanities. This year, I tried something different. I asked the students to design the course. I asked them to write the syllabus—come up with the big categories and decide what books to read—based on the principles I’ve outlined. Why this change in how to organize the class? Practical – because I was teaching it second semester, the students had already been thinking about the public humanities. It was a chance for them to consider what they’d learned, and what they wanted to learn. 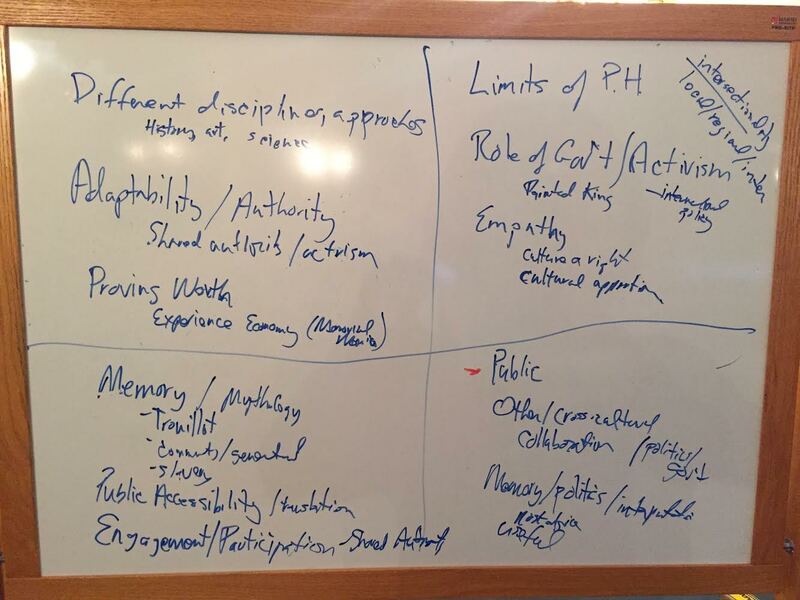 Philosophical – the big challenge in the field is the balance of authority/expertise and openness/participation. Why not try it in the class, too? I always try to do this, to some extent; this is an experiment in going further. The recent election has made me rethink the focus on community work that has been central to the way I’ve defined the field. I’ve always argued that public humanities is about community, for community. That has tended to mean that we are often talking to people who already define themselves as insiders. We haven’t been talking across communities. I think that’s a problem. I’d like to think about how public humanities might connect between, not only inside of, communities. The recent election (and politics more generally) has changed the field in the opposite way, too. It’s gone from academics teaching the public, to shared authority, to something more political. Call it decolonizing public humanities. What is the relationship between public humanities and activism? Rethinking the class to address that seemed urgent. 2008 Who Owns Culture? /Who Owns the Past? / Who Owns Community? What are the big themes? Intersections of: public, culture, community, history/heritage, memory/preservation, interpretation, organization. Those are the keywords for public humanities. What makes a thoughtful case study? One that not only tells a good story – here’s what happened – but which also steps back and generalizes? That’s the challenge of this course. Next, we broke up into new groups, students choosing the themes they were most interested. Their job, before next week’s class: to fill out the syllabus. Organize each theme into three or four sub-themes, and choose books and articles to read. I’ll let you know what they come up with. What might historic preservation learn from museums? Great idea and glad you were willing to take the risk. I’ll watch with interest the fleshing out of this syllabus. Love this idea. I think you should ask alumni at the upcoming conference to do the same exercise, and think about what they remembered from their course with you, and see if they come up with the same themes! A) it would be interesting to see how consistent the “world view” is that you teach through this course (I think it’s pretty consistent, since when we alumni as well as current students meet — even over drinks in informal gatherings — we always marvel at how we have a common language), and B) it would be cool to see any different interpretations of the themes that students have had over time. And……. how do I influence them to include “purpose” & the “Toothpick Museum” case study?! Best ever, still used, again & again & again. That + Falk & Dierking’s motivations of museum visitors. *Key* data that continues to inform my theory.